Before and after teeth whitening photos. The patient lives in Woodbridge, CT. He had a bridge with a lighter shade and wanted his teeth to match. We succeeded! Photo by Nicholas Calcaterra DDS. They say a picture is worth a thousand words and we agree! For more information on teeth whitening, visit this page, or ask Crystal or Toni at your next cleaning. Not a patient? Call us at (203) 799 – 2929 or visit this page to schedule an appointment. Is this causing dry mouth? Many older patients in our practice in Orange, CT take medications as part of their daily routine. However, many of these prescription drugs have an unwanted side effect: dry mouth, more formally called xerostomia. In fact, the most commonly prescribed medication in the United States in 2012 lists xerostomia a common side effect! Chronic dry mouth can have a profound effect on the oral cavity, leading to dental decay (cavities) as well as inflammation of the gum tissue. Without treatment, the results of the dry mouth can be devastating: loss of some or all of your teeth! 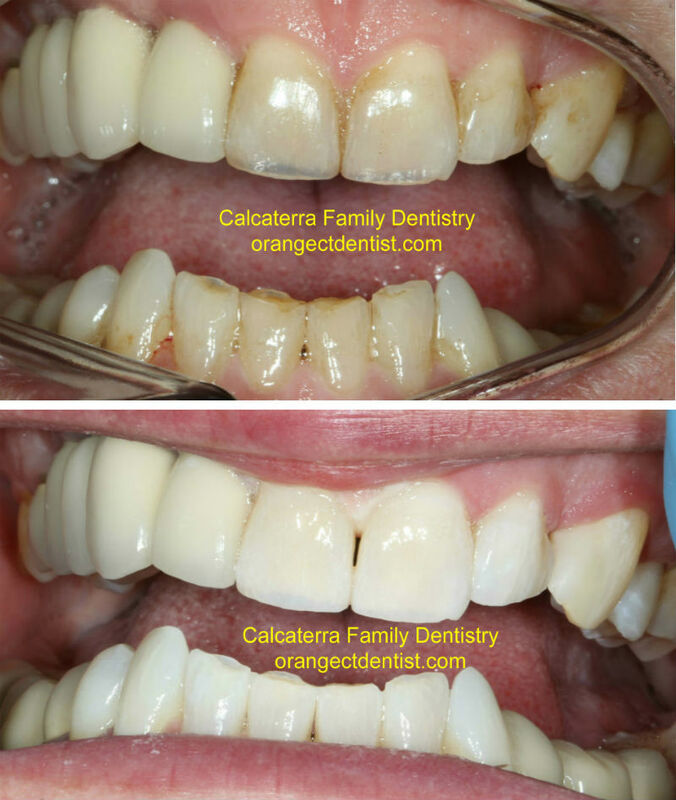 Teeth with decay (cavities) from chronic dry mouth on a patient from Woodbridge, CT. Photo and subsequent treatment by Dr. Nicholas Calcaterra. The above photo shows quite dramatically the decay (also known as cavities) that can occur due to dry mouth. 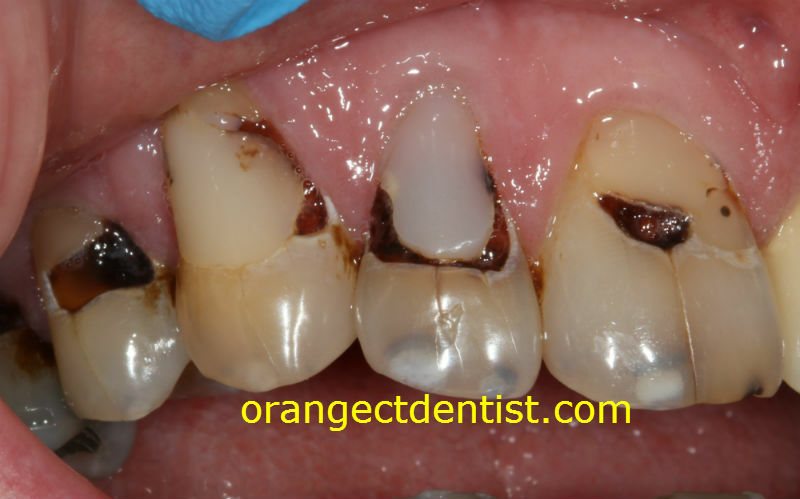 We see decay both at the gum line as well as near the edges or tips of the teeth. This is the classic pattern of decay due to xerostomia. The most widely prescribed drug in the U.S. is associated with dry mouth! Medications for high blood pressure: ACE inhibitors, Angiotensin II Receptor Blockers, Diuretics, and others. Anti-cholinergic medications used to treat a variety of conditions. Many anti-depressant medications (Zoloft, Celexa, etc.). 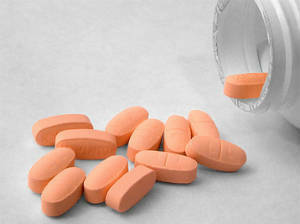 Narcotic based pain relievers such as Vicodin and Percocet. As previously mentioned, the most commonly prescribed pain medication in 2012 was Vicodin and is associated with xerostomia. Possess several anti-microbial proteins which kill harmful bacteria. Serves to mechanically cleanse and remove food debris. Helps to remineralize damaged tooth structure. As you can imagine, if the amount of saliva is reduced, the normal benefits of saliva are not realized. 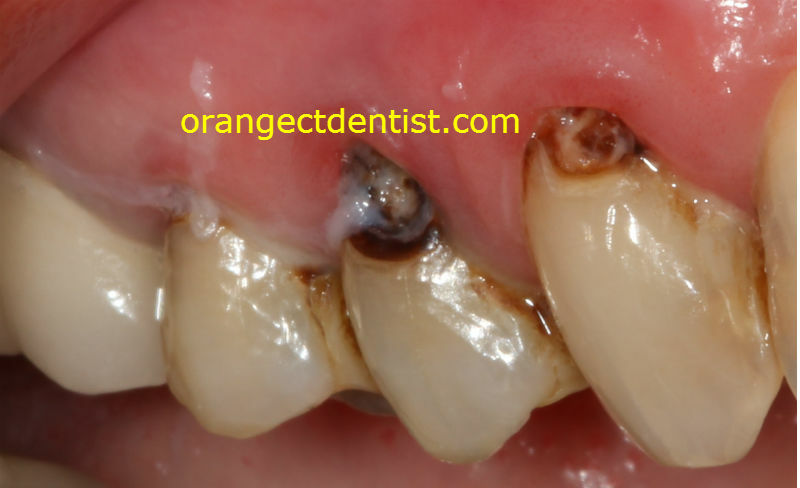 Another photo of dental decay from chronic dry mouth from medications. This patient was from West Haven, CT. Photo and subsequent treatment by Dr. Nicholas Calcaterra. High fluoride content toothpastes and rinses to reduce the likelihood of further tooth decay. An example is Prevident. Chewing xylitol based gum. The chewing action stimulates salivary flow and the xylitol is proven to reduce tooth decay. Various toothpastes, mouthrinses, gels and other products designed solely to moisten the soft tissue and help your mouth feel wetter. The products from Biotene are the most common. Sucking on sugar free candies throughout the day, stimulating saliva flow. You should work with your dentist and physician to determine if your medications are causing dry mouth and if so, the degree to which the dryness is affecting your overall oral health. From there, the appropriate treatment (if any) can be recommended.